Daydreams of Quilts is closing out our supply section of our shop. All fabric, paper patterns, quilt books and supplies are on sale 20 – 40 % off. Includes Heather Ross “Sugarplum”, Tula Pink “De La Luna” and Tim Holtz Holiday fabrics plus Elizabeth Hartman patterns, Wonderclips, sewing machine needles and more. Hello! I’m popping in with some shop news today. Flourish is now sale priced to clear at 40% off! Thank you so much for supporting our small Canadian family business! Prices on our website are in Canadian dollars. The grand prize winner in the Canadian Summer Quilt Along is Becky Keizer! Congratulations to Becky! She started later in the quilt along and not only caught up but finished her quilt top! Becky is known as @keizerquilts on Instagram. There were seven quilt tops entered in the hashtag on Instagram (not including designers in the quilt along). The winner was chosen by random draw from the names of the quilters who made those seven quilts. This concludes the Canadian Summer Quilt along! I hope everyone had a great summer and thank you so much for sewing along. Congratulations to everyone on finishing their quilt tops! Canadian Summer Quilt Along Quilt Pieced by Anita LaHay. Quilted by Dara Tomasson. Designed by 12 Canadian Quilters. Hello! I’m popping in today to let you know about a free Row Along starting up soon! The “My Happy Place Row Along” starts September 4th on the Seams to Be Sew blog. Marian does an amazing job hosting these row alongs every year and she has lined up many, many prize sponsors. All quilt row patterns are free for at least a week after each designer’s day so make sure to download your rows each day. After that week designers have the option of having a fee for their patterns. Find out more here and see the other designers in the row along. The Daydreams of Quilts Row comes out on September 27th. I can’t wait to show it to you! 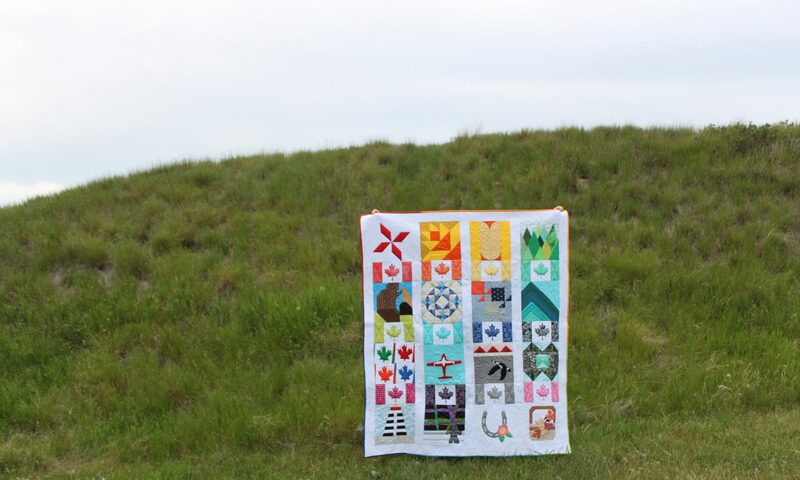 Welcome to the 12th and final week of the Canadian Summer Quilt Along! I have seen some amazing nearly-finished quilt tops popping up on social media! So exciting! This week’s block is designed by Julie Johnston of Owly Patterns. This one is another foundation paper pieced block and was the one that was the most challenging for me to sew. EDITED TO ADD: If you’re easily offended then do not click through to Owly Patterns as she has designed some patterns that some people find offensive. Anita’s version of Julie’s Snowbird block. Quilted by Dara of Stitched Quilting Co. I love how Dara put the mountains into the quilting! Julie’s Snowbird block represents the Snowbird Jets of the Royal Canadian Air Force that we see flying over special events and at air shows around the country in impressive flying formations. Head to Julie’s Craftsy shop to download your free block pattern for the Snowbird block. EDITED TO ADD: Julie has donated many hours of her time to create her free block pattern but if you’re easily offended then do not click through to Owly Designs. This is the final block in our quilt along. To enter the grand prize contest please post a picture of your quilt top in the hashtag #canadiansummerqal by September 3rd, 2018 (Labour Day). Your quilt top does not need to be quilted or bound (a flimsy is okay) but it does need to include at least 12 of the 16 blocks from the Canadian Summer Quilt Along. They can be set however you like and you can add other blocks/elements if you wish. To see more information about the grand prize and find links to our prize sponsors and all the blocks in the quilt along please visit the main Canadian Summer Quilt Along page. Thank you so much for quilting along with us! Thank you to all of our prize sponsors and block designers! I couldn’t have done this without you! I can’t wait to see everyone’s quilt tops! Thank you to Dara Tomasson of Stitched Quilting Co. for quilting my Canadian Summer Quilt Along quilt. Thank you so much to our sponsors and designers! Please visit the Canadian Summer Quilt Along page for links. A truly Canadian Quilt! Designed, pieced and quilted by Canadian quilters. Pieced by Anita LaHay. Quilted by Dara Tomasson. Designed by 12 Canadian Quilt Designers. Flourish Fabric and all Daydreams of Quilts PDF patterns are on sale 25% off now through Sunday. A selection of four Flourish Fabrics. These beautiful vibrant watercolour print fabrics will make stunning quilts and bags. With Fall around the corner I have released the Jack-O-Heart Pattern and the Turkey in a Pixel Heart Pattern as stand alone patterns. These were previously only available in my ebook “A Year of Pixel Heart Quilts.” These two are mini quilts and the Jack-o-Heart Pattern has measurements for a lap quilt. All patterns, including the ebook, are 25% off now through Sunday.